Recovery. The given time for the body and mind to rest, rebuild and earn performance gains. Without it, the possibility of injury, overtraining and burnout may increase, leading to poor performances. In other words, prioritizing recovery is a good thing to do within your daily training plan. There are many tools and techniques available to athletes that aid in recovery, but not many address both the mind and the body simultaneously. Studies highly support the importance of not only resting the body for recovery purposes, but giving the mind a chance to reboot as well. Yoga offers techniques that incorporate body postures (asanas), breathing exercises (pranayama), and mental focus practices (i.e. meditation, visualization) that can be used to enhance your recovery time and get you ready to attack the next training session. Below are four postures and techniques that help stimulate the parasympathetic (rest and rebuild) system, aid in releasing muscular tension and increase mindfulness or mind/body awareness. First is a pranayama that focuses on effectively using the diaphragm for the breath. Following are three asanas that target areas of the body that are repeatedly stressed during swim, bike, and run training sessions. 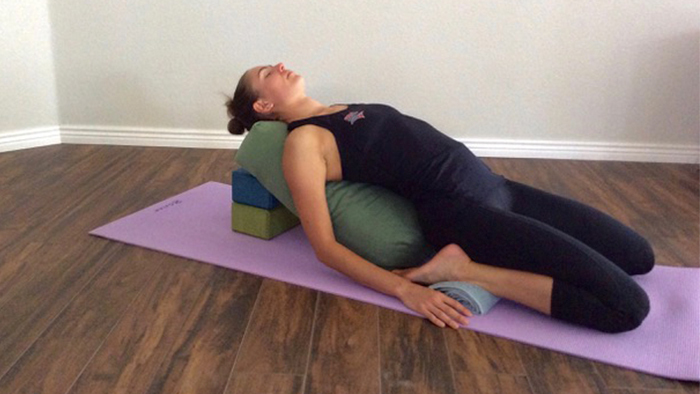 Pairing these postures with the diaphragmatic breath deepens the relaxation effect. Since you have already stressed these areas during training, there is no need to work it further during the recovery process. These poses require no muscle engagement and offer multiple modifications to best suit your needs and your comfort levels. You want to be able to hold each posture without the need to move or adjust. It is recommended to begin holding each posture between three and seven minutes to allow for the greatest benefit. Engages the diaphragm, elicits full lung capacity, and clears out stale air in the lungs; stimulates the parasympathetic system. Begin by emptying the lungs full of air, then inhale through the nose allowing the chest to rise first, then the belly. Exhale out through the nose by drawing the diaphragm in and up allowing the belly to press in towards the spine, then the chest follows. Repeat this sequence encouraging the diaphragm to control the breath. If it becomes uncomfortable at any time, take a few normal breaths, and then come back to the sequence. Sit on top of folded blankets, towels, or a bolster; sit with the feet hugging the sides of the bolster or lie in corpse pose (Savasana), place the hands on the chest and belly to monitor the breath, lengthen the exhale. Releases tension in targeted muscles and joints. Chest, abdomen, front of the hip, front of the thigh. Lie on folded blankets or a bolster, sit on top of blocks or folded towels, rolled-up towels underneath the ankle joint, lengthen the exhale. Improves range of motion for targeted joints, stimulates the parasympathetic system. Lie on a bolster, place rolled-up towels underneath the ankle joint, place a folded towel or a blanket behind the knee joint. Releases tension in targeted muscles, enhances blood circulation around abdominal organs aiding in digestive health. Place the top leg on top of stacked blankets, towels, or a bolster.